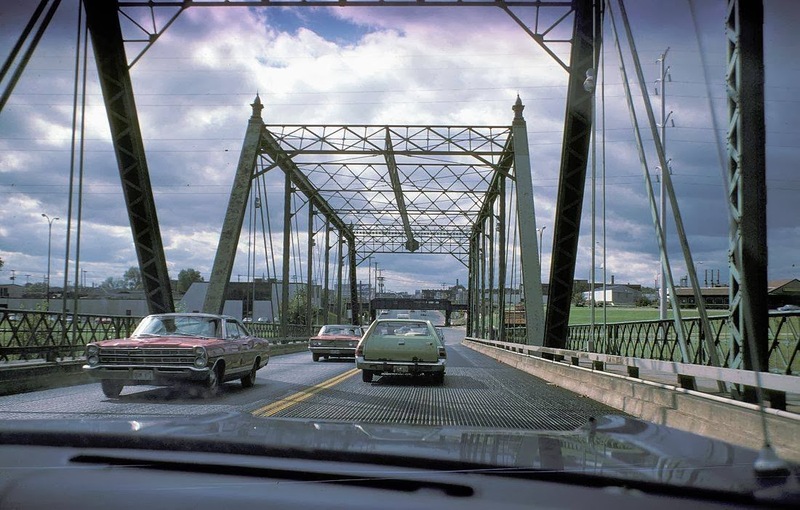 Top photo, Lowry Bridge 1958; bottom photo West Broadway Bridge, 1978. In the fall of 2013, a new Facebook group started up called "Old North Minneapolis." Its administrators tend to focus most of the content on items north of Lowry Avenue, since that's their part of the community. 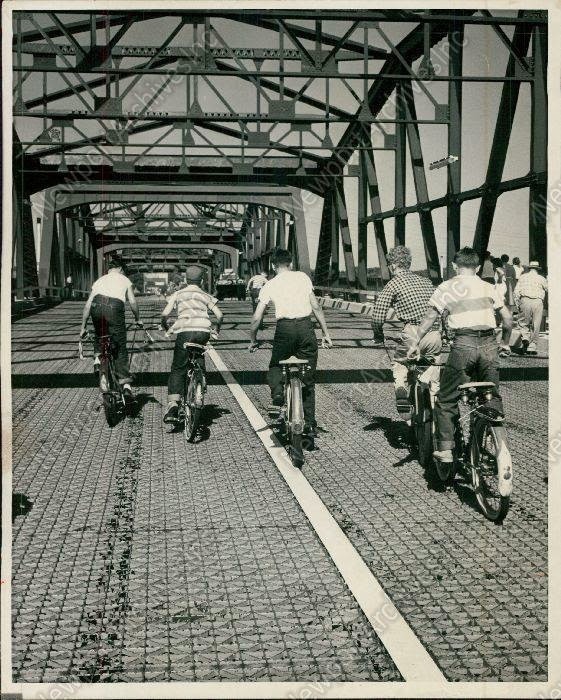 But the page contains a wealth of photos from across the northside. Over Christmas break, I downloaded ninety-five photos from the page, and there have been perhaps two dozen more added since then. My goal is to get every picture that's posted on that page--and eventually the Camden Community Historical Society FB group as well, although there's some overlap of pictures--posted on Historypin. For the uninitiated, Historypin is a website and smartphone app that allows old pictures to be layered on Google street view. Once the picture is "pinned," then anyone with the Historypin smartphone app can stand in front of the physical location of the photo and see, through the camera view of their phone, what was there years ago superimposed over what is there today. Long-term, I would love to see this app used to coordinate historic walking tours throughout north Minneapolis. But in order to do that, photos need to be pinned on the site. And in order to pin a photo, I need three things: a physical street address where the picture was taken (sometimes problematic if the actual address no longer exists; when a bunch of properties have been torn down and been combined in to one parcel, for instance, then photos can be jumbled together), a year when the photo was taken (and since that's not always clear from the picture or someone's personal knowledge, it's often guesswork based on cars and clothing), and the man-hours needed to layer the photo on the site. The last item is the most important. It can take 5-10 minutes to do one picture, which is not too burdensome unless you've got a few hundred pictures to wade through. But if a few members of these pages made a habit of pinning a photo when the post to Facebook, then we could make our communal history far more accessible. Photo from the envelope of this year's NAZ Christmas card. 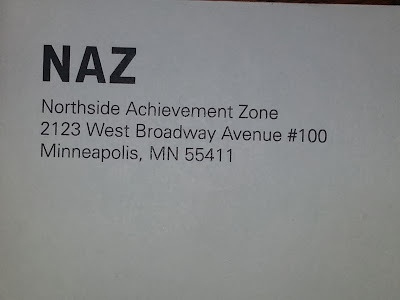 First things first, I do think the Northside Achievement Zone is doing good work in north Minneapolis, and we're a better community for it. And I chose to publish this now, instead of around the time of their gala, so as not to discourage supporters from attending. 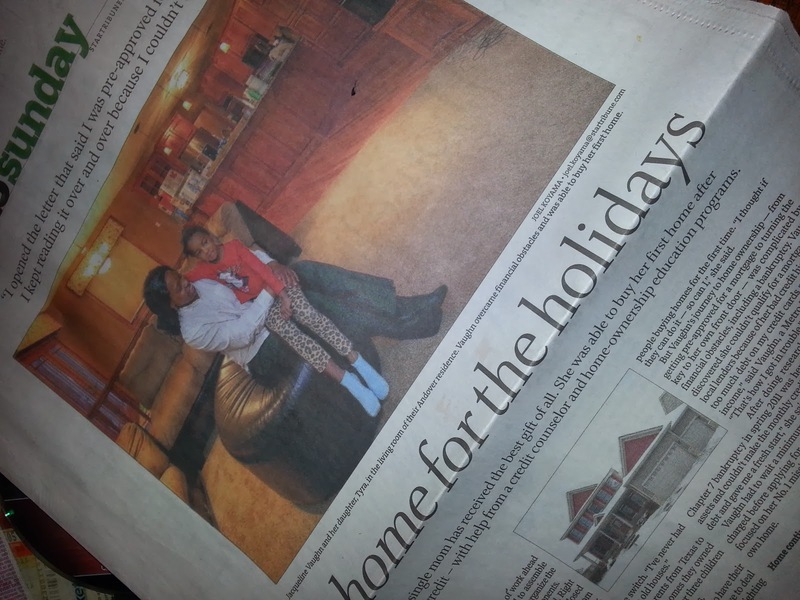 Sunday's edition of the Star Tribune had a heartwarming story of someone who had bought her first home after significant financial obstacles. In today's housing market, there are more and more of these "ready again" buyers--people who are purchasing a new home after recovering from a bankruptcy, foreclosure, or short sale. I should know; I was one of them. After a divorce, my home went into foreclosure. My ex-wife remained in that house, but was unable to get my name off of the loan or keep up with the payments. We notified the mortgage company when she decided to move out. I returned at one point to explore moving back in and seeking a loan modification that would be workable under one income, but found a skating rink in the basement due to burst pipes from a poor job of winterizing the place.